The name “umbrella” typically refers to a liability policy that is sold in increments of 1 million dollars and provides liability coverage over and above the underlying liability limits of common personal lines exposures such as an individuals auto’s, home, rental properties, recreational vehicles etc. The policy differs slightly from an excess liability policy in that while an excess liability policy covers only the exposures covered by the underlying policies, an umbrella policy occasionally “drops down” to underlying policies to provide coverages that may not otherwise be covered. When considering an umbrella policy, a good suggestion is to purchase it from the same insurance company that provides your primary personal lines such as your home and auto insurance, because the features and benefits of the umbrella policy from a given insurance company are designed to work in conjunction with the coverages provided by the underlying policies. This prevents possible gaps in coverage. The term “umbrella” refers to the nature of a single umbrella policy providing broad liability coverage over and above several underlying exposures. 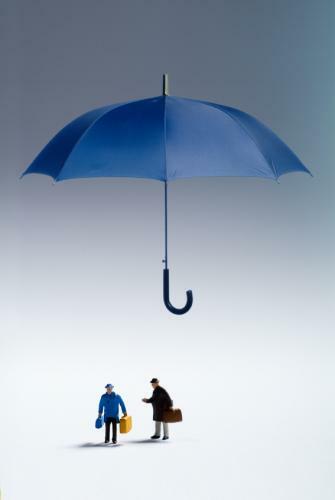 Umbrella policies do require minimum liability limits on underlying policies. For auto insurance, the limits of liability required vary by company but are typically 100,000/300,000 or 250,000/500,000 and for home insurance the typical liability limits required are usually 300,000. Perhaps the greatest benefit to purchasing an umbrella policy is the benefit of claims defense costs outside of policy limits on most policies. Click here for a great real life example of the benefits of an umbrella policy involving former wrestler, Hulk Hogan. A good rule of thumb is to talk with your insurance advisor to see if an umbrella policy is a good fit based on your particular financial situation. A good advisor will review your current financial position including cash on hand, equity in your home (or other real estate investments), your current family income as well as several other factors to determine how much assets you may have exposed in the event of a lawsuit where you or your family were found liable. In general, an individual should consider carrying at least as much liability insurance as they have assets at risk from a lawsuit. Historically, California jury awards stemming from lawsuits involving individuals that have sustained bodily injury from an accident have been very high. According to “Current Awards Trends In Personal Injury- 46th edition”, the average California vehicle liability award in 2005 was $406,576 and for premises liability it was $541,117. Clearly, the financial stakes are high while the costs of purchasing coverage is very low. Depending on how many underlying exposures an individual has, a 1 million umbrella policy can be purchased for as little as $15 per month. If your personal net worth may exceed $500,000, evaluating the benefits of a personal umbrella policy with your insurance advisor is a sound investment.